Saying good-bye is not a personal strength and not something one “gets used to.” But I can say that I wish I had what my preschoolers at All Seasons Preschool have; the chance to be with those in their final chapters of life, the opportunity to simply share experiences with older generations, and the gift to fiercely bond with a classroom grandma or grandpa. 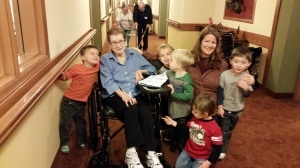 For the Spring Room students, our gift was Grandma Bette. 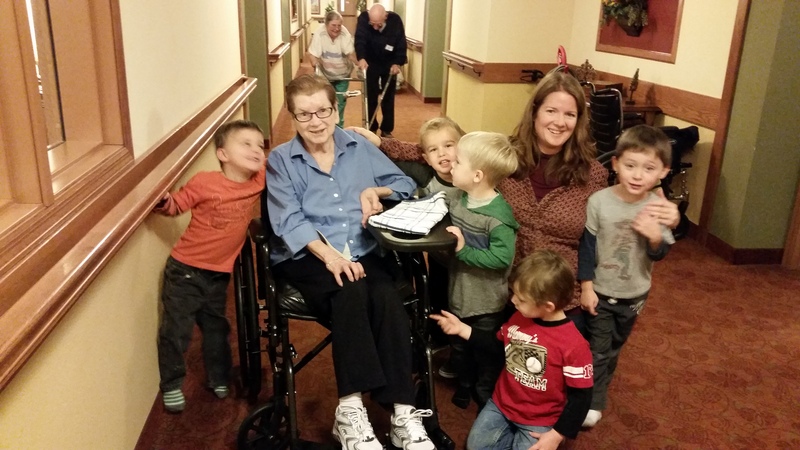 We couldn’t have asked for a better grandma to be our reader. She showed us all her patience, gratitude, generosity and humility. Having had a stroke in her spine, she had very limited use of her arms and legs. Without needing any explanation, the preschoolers in the very first Spring Class knew just what to do. They hugged her fiercely, understanding only their arms embraced. They brought their treasures to the tray attached to her wheelchair, turning them around as they shared details. Without hesitation, they fed her treats we had made. Children fed her. This act of deliverance and acceptance stopped me in my tracks every time. Because I would’ve hesitated. The children saw Grandma Bette through unclouded eyes and simply acted in kindness, without pity. Thank you, Grandma Bette. Thank you for teaching this teacher and for loving all of us Springies. We loved you. The following message was sent to Spring Room families in late July. It is with the utmost heartache I am sharing the news of Grandma Bette’s passing. Her connection to the Spring Room will long be remembered in the hearts of all the lives she touched. She came on board as our weekly “Reader” but soon became a part of the daily workings within the class. Yes, she read to and with us on Wednesdays, along with her friend Grandma Jeri. But she was also someone the children made art for, saved portions of their favorite foods for, and shared songs with. The Springies often wanted their block buildings and completed puzzles left out in anticipation of her visit. When the ribbons in the giant wreath were changed with the seasons, the class watched for Bette’s delighted reactions. 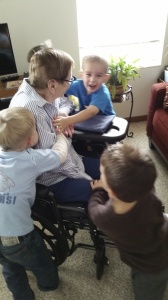 She let the children push her wheelchair, not minding the multiple crashes into doorways – or the speed. Even though she couldn’t go shopping, Bette found ways to share holiday gifts with the children. She told the kids to make themselves at home in her apartment and they didn’t hesitate. Her couch was soft, with piles of blankets and a stuffed cat (which Jeri naturally knew to take charge of to avoid squabbles). Rides up and down in her remote controlled lazyboy were the most fun ever! Her humble spirit is irreplaceable. With the preschoolers gone for summer break, they weren’t able to make final visits. Part of me believes this was Bette’s choice. To not make a fuss….to perhaps give another grandma a chance to be our reader. 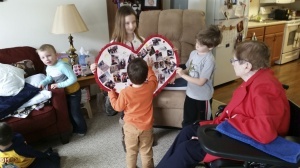 Hearing about her death, the children’s questions were touching – wondering where her friend Jeri was, asking if she was old, contemplating if her room was now empty, commenting on how much they will miss her. Showing the striking value of intergenerational communities through honest experiences and reflections. What a gift.